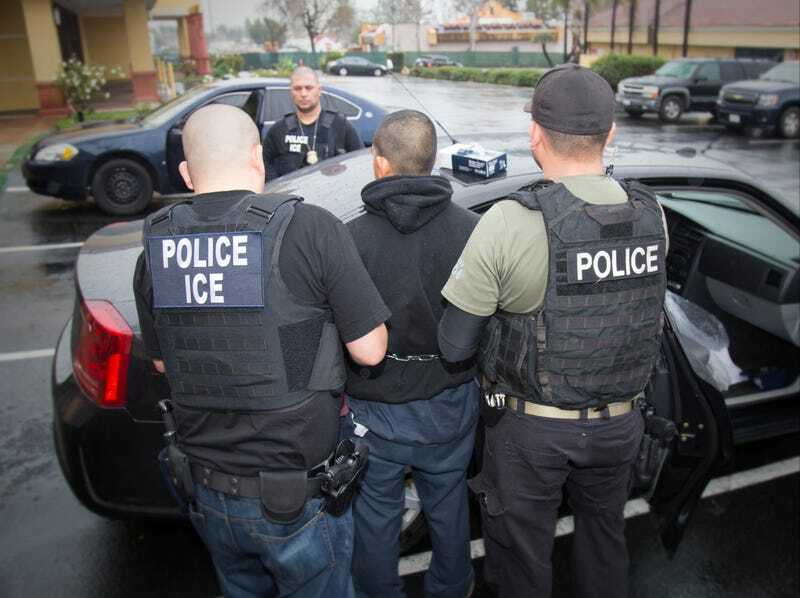 United States immigration authorities conducted raids in at least six states this week that resulted in the arrests of hundreds of undocumented immigrants. According to the Washington Post on Saturday, officials said the raids targeted undocumented individuals with criminal records, but that some people without records were also detained. The raids occurred at homes and workplaces in Atlanta, New York, Chicago, Los Angeles, North Carolina and South Carolina. The exact number of people arrested is not known. A video that circulated on social media Friday appeared to show ICE agents in Texas detaining people in an Austin shopping center parking lot. Immigration advocates also reported roadway checkpoints, where ICE appeared to be targeting immigrants for random ID checks, in North Carolina and in Austin. ICE officials denied that authorities used checkpoints during the operations. On January 25, Donald Trump signed an executive order significantly expanding the categories of undocumented immigrants that the Department of Homeland Security can officially target to include those convicted of minor offenses or who have never been convicted of a crime at all. In the days following his electoral victory over Hillary Clinton, Trump vowed to carry through on his campaign promise to deport and incarcerate up to three million undocumented people residing in the United States. The incarceration portion of this pledge also appears to been the works, as one of Trump’s executive orders on immigration included a call for new migrant detention facilities along the U.S.-Mexico border. In New York City last night, hundreds gathered to protest Trump’s anti-immigration executive orders and the recent raids conducted by Immigration and Customs Enforcement. Protests also took place in LA on Thursday and Friday. According to CNN, LA’s ICE field office director, David Marin, said that planning for the deportation operations carried out in his city this week began under the Obama administration. “We do these operations two or three times year,” Marin explained. “This is on par with past operations.” Marin acknowledged that about a quarter of the 160 individuals detained in the LA raids this week had misdemeanors or were arrested for being in the country illegally, while the rest, he claimed, had felony convictions. Can You Picture Trump Wearing an Ornate Ruby and Emerald Pendant Necklace?